One of the platters I traditionally order at the Greek festivals is the lemon roasted chicken served with Greek lemon potatoes, braised green beans, and dolmades. It is so good. The food is a big plate of warmth and comfort. My quarterly Pomora olive oil came in! This is a food bloggers dream to have such an amazing package of high end olive oil delivered to your door! When I received my quarterly Pomora Olive Oil shipment in the mail, I wanted to create something special with the olive oil. 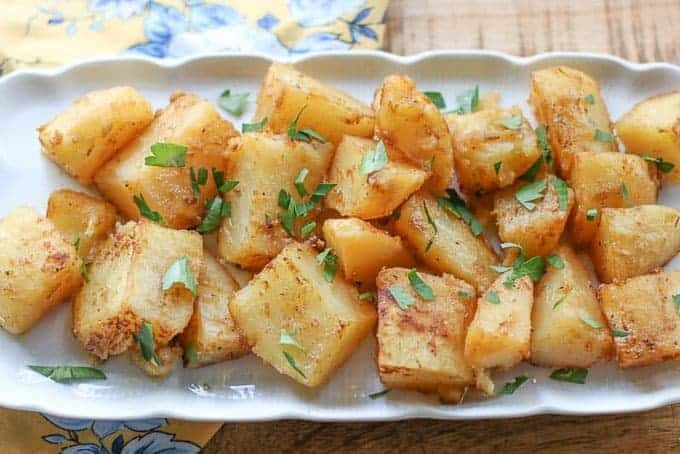 These tasty Greek lemon potatoes were the perfect dish. Pomora Olive Oil is foodie’s dream gift. 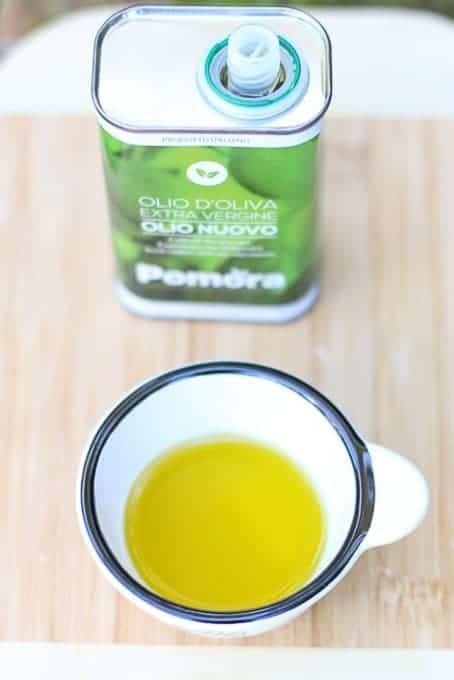 When you sign up, Pomora sends crafted gourmet olive oil straight from their beautiful Olive Groves in Italy. Quarterly you will receive a shipment of 3x250ml tins of oil from your tree alternating between gourmet selection of a plain oil quarter and a flavored oil quarter. Their olive oil is exceptional in quality. You can see and taste the difference compared to other olive oils. I personally get excited each time a box arrives. I can’t wait to open the box and create fabulous dishes with this amazing olive oil. It really makes a dish special when you use Pomora olive oil in the ingredients. This month I received the Olio Nuovo assortment which is unfiltered with a distinct fresh flavour and a pizzicante finish. It is INCREDIBLE. 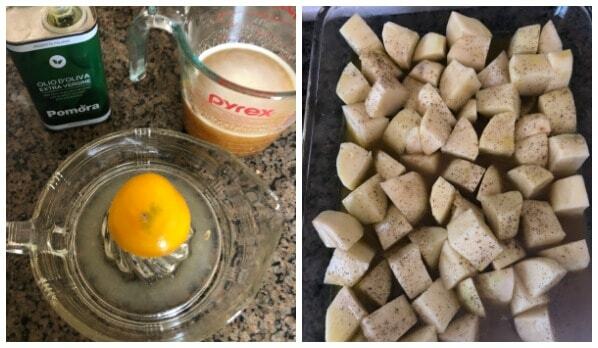 This is an authentic Greek Lemon Potatoes Recipe. 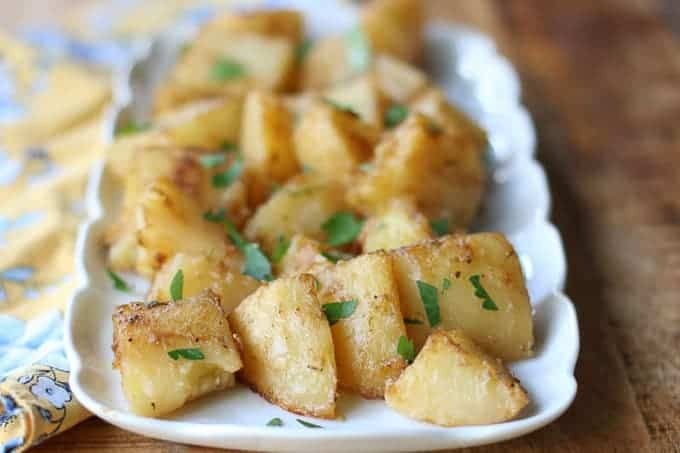 The roasted potatoes are super easy to make, they just take a bit of patience. First you mix olive oil, chicken broth, and fresh squeezed lemon juice together. Peel Russet potatoes and cut into large quarters. Pour mixture, along with additional spices listed below in the recipe card, over the potatoes. Cook potatoes in the oven covered for an hour and half, then uncovered about 30 more minutes. Be patient. The wait is worth it. 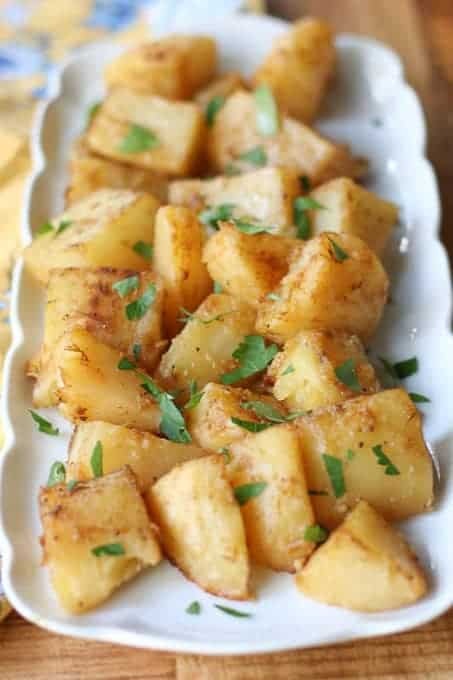 These Greek Potatoes are so flavorful and delicious. They are a great side dish for entertaining. They are also perfect for a special week night meal. My daughter LOVES them. This is a dish I can make without any “sas” back. Instead I get a big, “THANK YOU MOM!” Enjoy! If you like this recipe, check out: Jalapeño Chimichurri Sauce, Low Carb Moussaka, and Greek Seven Layer Dip, . Peel the potatoes, cut into large quarters, and place in a 9x13in baking dish. Mix remaining ingredients and pour over potatoes. Cover with foil and bake at 350 for 1 1/2 hours or until potatoes are fully cooked. I am so glad you enjoyed them Sandy! Thanks for sharing. This is excellent. I will make it over and over. Thanks. My Greek grandmother just turned over in her grave. 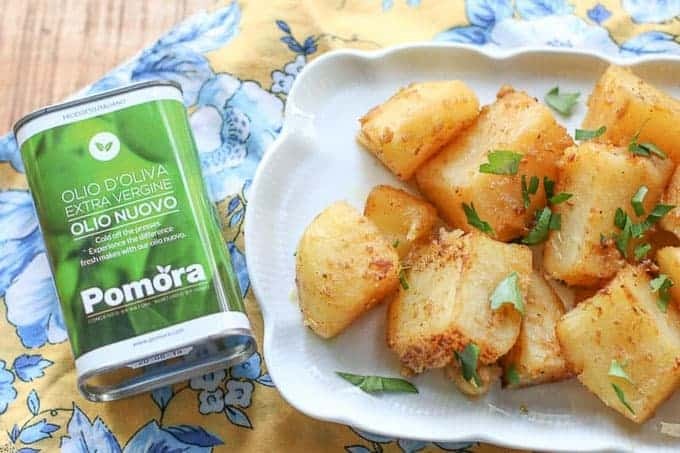 Greeks only use Greek olive oil to make lemon potatoes (lemoni patatas). Your dish still looks lovely…:). Love lemon potatoes! There’s a local restaurant that does a great version but, of course, they’re always better at home 😉 Bet these would not only be lovely for dinner, but also for breakfast with eggs (and lots of coffee). Have a great weekend, Katie! P.S. How neat to try different olive oils?? So fun! Those look delicious and perfect for breakfast, lunch or dinner. They look so perfectly golden and just the right amount of crispy!